The photo on the right shows the front viewed from directly above. 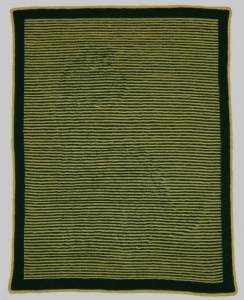 The blanket was made in DK yarn and measures approximately 81 cm x 104 cm (32” x 44”). It can be made in any yarn though this might change the overall size. The instructions are very easy to follow, using a method of charting that we have devised ourselves. The size could easily be adjusted, by making wider borders all round, to make an afghan for an older child.